A magnificent first half save by Ger Condon and two goals in the third quarter by Martin Cronin earned first division underdogs Ballyvolane a shock 2-0 advance over Premier outfit Coachford in the Lucozade Sport Munster Junior Cup. It was a grim morning at The Glebe for Coachford manager Mickey Walsh. His game plan worked a treat in the first half except for the key fact that his charges didn't take their chances. It was a different story after the interval. 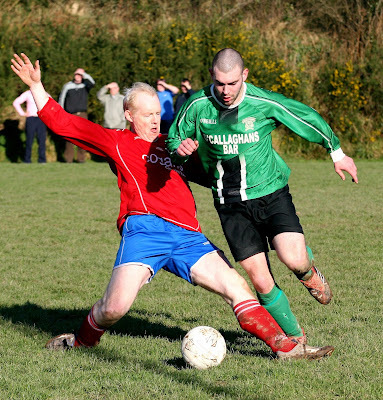 By then, Ballyvolane player-manager Derek Mellerick had his side clicking, though it took a soft goal to put them on their way. 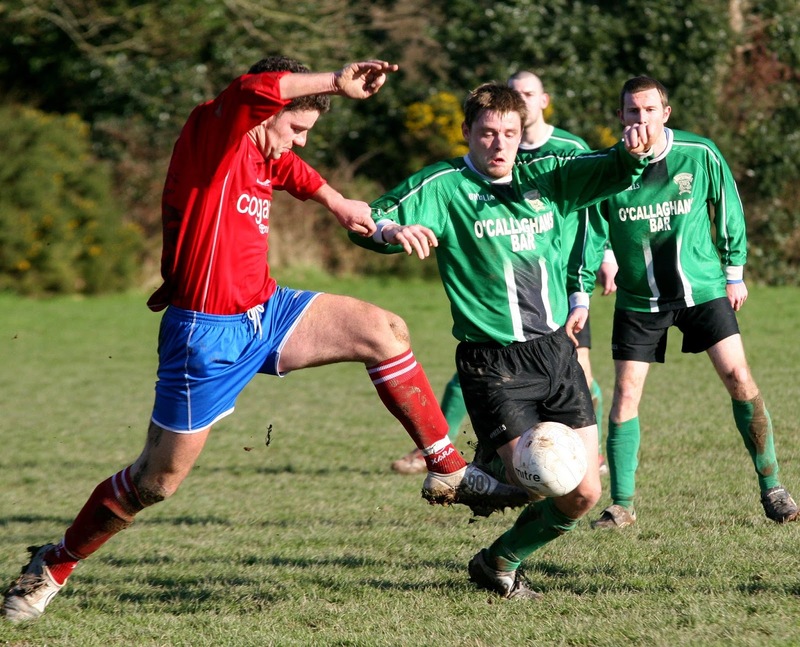 That opener came in the 62nd minute after good combination, by Peter Nugent and Paul O’Callaghan on a Ballyvolane break, had produced a corner. Cronin swung it in. 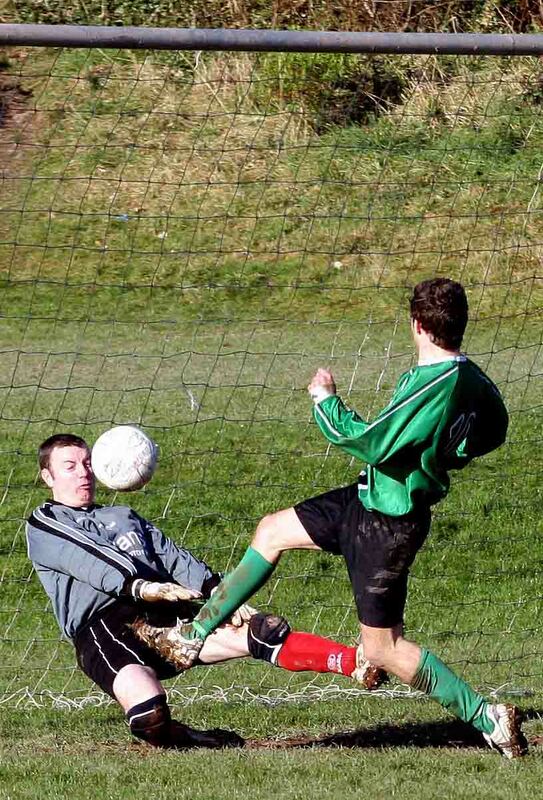 Keeper Peter O’Riordan had the harsh sun in his eyes, and the ball dropped over the line. Ballyvolane were quick to break from Coachford frees and corners and usually found quite an amount of space up the right. It happened again in the 65th minute and Cronin broke into the box. Colleague Dave Swann was waiting on the penalty spot for a pass and the defence also seemed to expect a pull back but Cronin let fly from an narrow angle and lifted the roof of the net. Despite having three subs on, Coachford disappointed after that setback. True, they fought hard but lacked inspiration. 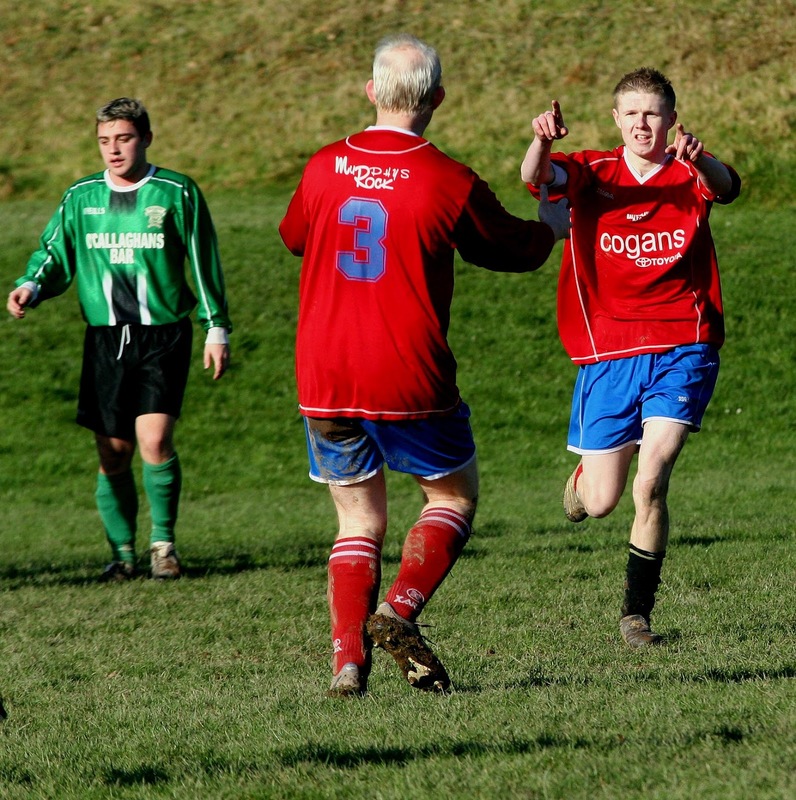 They did come close in the 78th minute, thanks to their two senior players. Skipper Paddy Martin whipped in a terrific cross from the left but midfielder Darren O’Brien got under it and headed over Condon’s bar from close range. The better chances continued to fall to Ballyvolane and Cronin had a few opportunities of completing a hat trick. One came in the 67th minute. Again he found acres of space on the right and, from 18 yards, flicked the ball past the advancing keeper but it hopped just wide of the far post. In the 79th minute, sub Kevin O'Keeffe hit a brilliant diagonal ball from half-way and found Cronin on the edge of the box but his shot was blocked before it really got going and the hat trick will have to wait for another day. 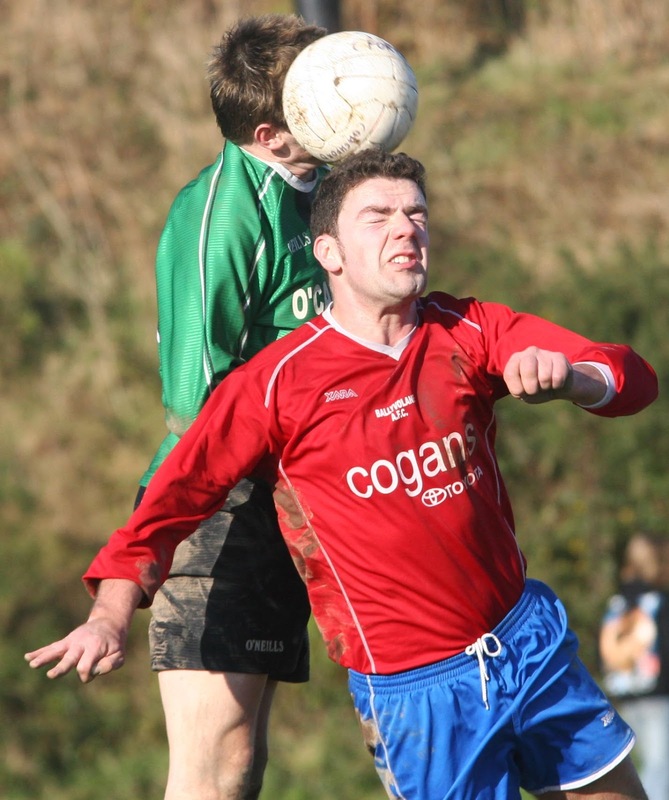 Coachford will look back with regret to that first half and the chances that went a begging. The first came in the 13th minute when, following good work by JP Heffernan and Alfie Davis, Finnegan got a close range heading chance but, unmarked, he directed his effort wide of the near post. While Coachford dominated possession in this period, they didn't make that many chances but had one again in the 35th minute. This followed a terrific run on the right touchline by defender Ciaran Lucey. 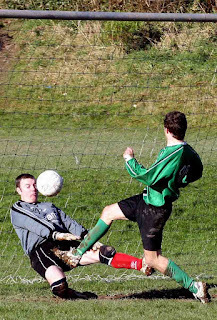 His cross was knocked out to the 18-yard line but Heffernan got well under it and there was no danger to Condon’s goal. The turning point came in the 41st minute. Condon was caught a yard or two off his line when Steve Hackett let fly from 30 yards. That shot cracked off the bar and bounced out but Condon recovered to incredibly knock away the close range follow-up effort by Finnegan. Coachford would not create as clear a chance again. The second half belonged to the visitors and in particular to young Cronin. Ballyvolane are away to either Cloughjordan of Tipperary or Drinagh Rangers of the West Cork League in the fifth round. Coachford: Peter O’Riordan, Paddy Martin (captain), Steven Goulding, Ruan Linehan, Ciaran Lucey, Darren O'Brien, Alfie Davis, JP Heffernan, Eric Ryan, David Finnegan and Steve Hackett. Subs used: Robert O’Keeffe for Davis (55th minute), Colm O’Grady for Ryan (60th) and Keith Linzell for Linehan (68th). Ballyvolane: Ger Condon, John O’Driscoll (captain), Derek Mellerick, Steven Burns, Paul O’Callaghan, Peter Nugent, Brendan Nyhan, Niall Guiton, Dave Keohane, Martin Cronin and Dave Swann. Sub used: Kevin O’Keeffe for Swann (76th). Referee: Denis Crowley. Assistants: Damien O’Mahony and Richard Murphy.